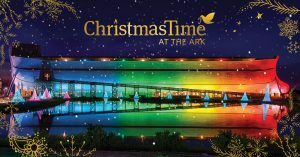 Introducing ChristmasTime at the Ark! Join us for our free ChristmasTime event (for only the cost of parking) December 8-23 and December 26-January 15 featuring a world-class laser projection show, dazzling light displays, animals from around the world in our Ararat Ridge Zoo, an extensive fair trade market, and more! Visit https://arkencounter.com/christmas for more info.